The 69th edition of the Scottish Junior Open concluded this past weekend with 3 Scottish players picking up titles and a further 5 finishing as runner-up. Rory Stewart and Elspeth Young led the way in the Boys and Girls U19 events, with Rory claiming his first ESF title after 8 years of trying and Elspeth adding to her Irish Junior Open title won in November. Richard Hollins was the other home winner as he collected the Boys U17 title. Rory dominated the event from start to finish, defeating English opposition in every round. Only Matt Broadberry was able to extend him beyond 3 games – in the semi-finals – before Rory eventually ran out a comfortable 5/11, 11/5, 11/4, 11/3 winner to reach the final. Hopes of an all-Scottish final were high when Craig Valente-Wallace took a 2-1 lead against 2nd seed, Matt Bedwell, but Bedwell recovered to win 11/6, 4/11, 9/11, 11/9, 11/8. Rory started the final against Bedwell looking relaxed and focused, playing at a pace that the young Englishman struggled to cope with right from the start. He eased ahead to a 10/3 lead in the first and never seriously looked threatened as he won the match 11/6, 11/6, 11/6 in 24 minutes. Craig managed to get the better of Broadberry in another 5-setter to finish 3rd, this time squandering a 2-0 lead before he recovered his concentration in time for the 5th to win 11/3, 11/9, 12/14, 7/11, 11/7. A Scottish 1-2-3 was already guaranteed in this event by the end of Day 1 after Elspeth Young, Carrie Hallam, Claire Gadsby and Kirsty Lobban all won their initial Pool matches to end the day undefeated. Saturday morning saw Claire beat Kirsty and Elspeth beat Carrie (both 3-1) to top their Pools and avoid each other in the semi-finals. The first semi-final saw Elspeth beat Kirsty 3-1 before Carrie took a 2-0 lead against Claire as she threatened to repeat her recent win against Claire at the ESC Junior Open last month. Just as it looked like Carrie was about to ease to a comfortable 3-0 win at 5/2 up in the 3rd, the momentum suddenly shifted and Claire was able to fight back to win the game. From then on Carrie seemed unable to regain her composure, understandably still ruing the missed opportunity in the 3rd. Claire finally came back to win 7/11, 7/11, 11/7, 11/7, 11/8 to set up a repeat of the Irish Junior Open final with Elspeth. The final turned out to be a high quality match between the pair, in contrast to their match in Dublin which saw numerous errors from both players. On this occasions it was winners that dominated the rallies as they shared the opening 2 games. Elspeth pulled clear in the 3rd and held on in a close 4th game to win 11/6, 9/11, 11/6, 11/9 for her 2nd ESF title in the space of 2 months. In the 3/4 play-off Kirsty ensured an identical podium to the one in Ireland with another win over Carrie, holding off a comeback after Carrie had recovered from 2-0 down to force a decider with Kirsty winning 11/9, 11/8, 5/11, 9/11, 11/5 in the end. Richard Hollins justified his place as top seed to claim his first Scottish Junior Open title, becoming the first Scottish winner of this event since Peter Nicol back in 1988. His first real test came in the semi-finals where he faced hard-hitting Pakistani, Usmar Hassan. Richard started well and after narrowly winning the 2nd 13/11 he looked like he would be safe but Hassan fought back to claim the 3rd 11/2. The fourth was a tense and scrappy affair with Richard eventually winning 11/8, 13/11, 2/11, 11/9. In the final he faced Jamie Todd (Eng), who had survived two 5-setters against Patrick O’Sullivan in the quarter-finals and the defending champion Juan Segundo-Barreyro (Arg) in the semis. Richard got off to the marginally better start but there was never much to separate the 2 players. Just as he had done in the semi-finals, Richard won a tie-break in the 2nd to take a 2-0 lead, only to lose his concentration and let his opponent back in the match. He reached match-ball at 10/8 in the fourth only to lose the next 4 points to see the match go to a fifth before eventually winning 11/9, 12/10, 6/11, 10/12, 11/8. 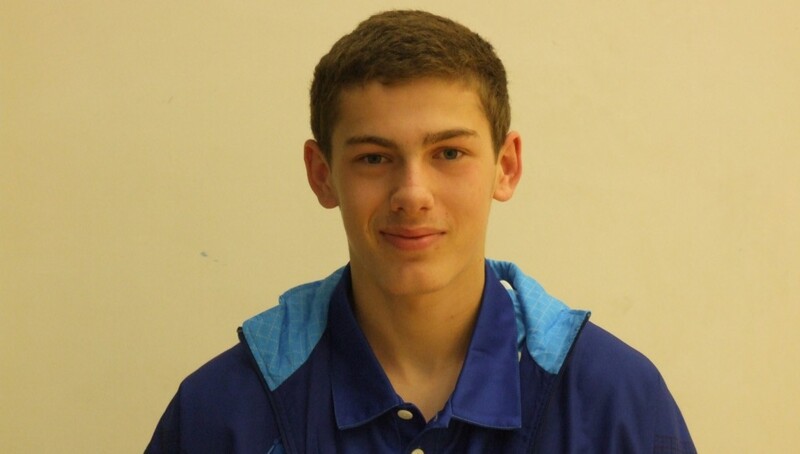 Ross Henderson had an excellent event, defeating Patrick 3-1 to finish as the next highest Scot in 5th place. Satomi Watanabe (Jpn) and Emma Fitzsimmons both progressed to the final without dropping a game. Watanabe, who is already competing on the Women’s professional circuit and ranked 118 in the world at just 15 years old, proved too strong for Emma, who performed well and stuck to the task at hand throughout the match without ever seriously threatening the Japanese girl who won 11/3, 11/3, 11/6. 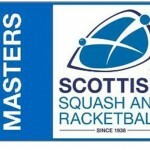 Two of Scotland’s brightest prospects, Alasdair Prott and Chris Murphy, were seeded to meet in the final of this event. However, with Pakistan’s Dorosham Khan having finished 6th at the British Junior Open, it was him who started the event as favourite, with several other players from Argentina, Peru, Switzerland and England also in contention. Alasdair beat Keane Appleton (Eng) 3-1 in the quarter-finals while Chris was unfortunate not to go 2-0 up on Jeremías Azaña (Arg), losing 12/10, 8/11, 11/5, 11/3. In the semi-finals, Alasdair again won 3-1, this time overcoming Rafael Galvez (Per) to progress to the final where he faced Dorosham Khan (Pak). Despite playing his best squash of the weekend, Alasdair was unable to win the first game. The quality of squash from both players was even higher in the 2nd but at 5-5 Alasdair lunged into the front and appeared to strain his back. A 3 minute injury time out between games wasn’t enough time for him to recover and he finally lost 11/8, 11/6, 11/5. Meanwhile, Chris won his remaining 2 matches to finish a credible 5th. James Dougan was the other Scottish top 8 finisher in 8th place. European No.1, Nadia Usenko (Ukr), was the strong favourite in the GU15 category. Nadia has dominated the European Junior Circuit in recent years and was the defending champion. She eased through to the final where she face the rapidly improving Georgia Adderley. Georgia had finished 9th out of 10 entrants last year when Nadia won the title but the difference in her game over the past 12 months is hard to do justice with words. She beat Poppie Jaram (Eng) 3-1 to top her Pool before beating Maddie Orr in the semi-finals. Maddie had progressed to the semis against the seedings after an excellent 3-1 win over Emma McGugan (Ire) who beat her 3-0 at the U15 Five-Nations last season. The final was probably the stand-out match of the day in terms of quality and determination from both players. Georgia pushed Nadia all the way in the first, holding game-ball before she eventually lost it 12/10. The 2nd game was even more intense and hard-fought with Georgia managing to level at 1-1 (13/11). A good start by Nadia in the 3rd allowed her to run away with that game to take a 2-1 lead but once again Georgia would not lie down and continued to give everything she had. Towards the end of the 4th the normally calm and composed Ukranian started to look flustered and desperate as her ice-cold demeanor finally started to crack with signs of emotion. In the end she was able to close out the match 12/10, 11/13, 11/3, 15/13 in a match that Georgia can only be proud of. Maddie missed out on 3rd place when she lost to Poppie to finish 4th, while Katie Gregson-Macleod also had a good tournament beating Ariana Pavia (Arg) and Emma McGugan to finish 5th. The Boys U13 event was the only final without Scottish interest on the final day of play. 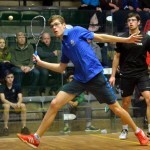 British Junior Open runner-up, Haris Qasim (Pak), beat Adam Goad (Eng) to take the title. Scottish interest was led by Craig Thomson who finished 5th after losing to Emilio Velazquez-Hernandez (Mex) in the quarter-finals. Craig beat Fraser Laing 3-1 in the 5/6 play-off to justify his recent promotion to the National Talent Squad. Scotland’s record of having at least one player in all the Girls finals was maintained thanks to Orla Young, who won her round-robin Pool without dropping a game. Orla strikes the ball well and moves around the court effortlessly for someone so young. Unfortunately for Orla her opponent in the final – Marina Stefanoni (USA) – possessed both of these skills in equal measure, combined with a greater ability to execute her shots with more precision. Marina dominated the early exchanges before Orla settled into the match but the American was too strong in the end, winning 11/1, 11/4, 11/8. However, it would be no surprise to see Orla make the same progress as Georgia over the next 12 months and beyond. The event highlighted the growing strength of Scotland’s junior girls at all age groups. Arguably the most promising group of juniors that Scotland has produced over the past 20 years, there is no reason why they can’t form the basis of a senior Women’s team that can challenge for success in the same way as our senior Men are currently doing. With several players having already committed to squash by moving to Edinburgh in the past 6 months to train with the Performance Programme at Heriot-Watt on a daily basis, it would be no surprise if a pathway has now been established for others to follow. On the Boys side, the current strength of our Senior Men’s team makes breaking through into this elite group more challenging than ever but players such as Rory and Richard look more than capable of meeting the challenge providing they continue to work hard with the required level of commitment. Several younger players also demonstrated that they have the potential to develop into elite seniors over the coming years. For full draws/results for all age-groups please click here.